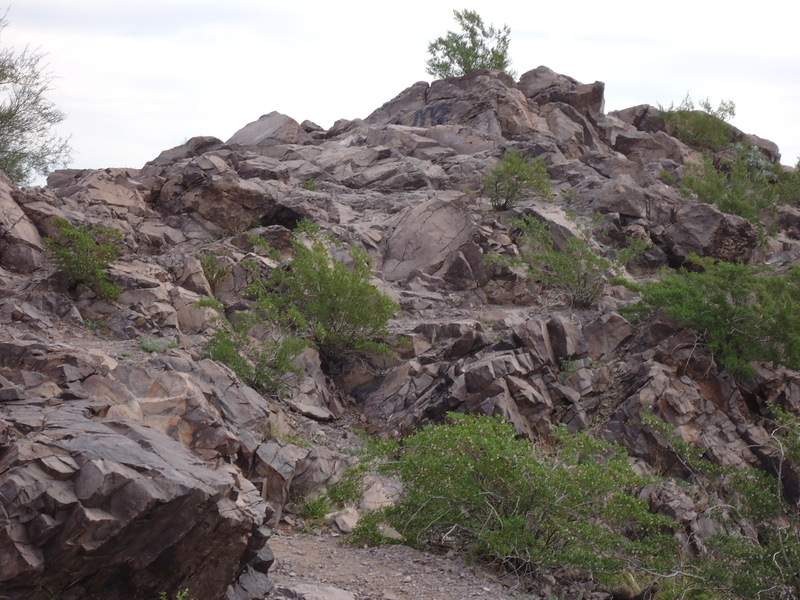 Three years ago I hiked nearby Hayden Butte, also known as Tempe Butte and “A” Mountain for the big “A” on its face (for Arizona State University). I made it most of the way up, but turned back before reaching the top, because after negotiating what was for me a very challenging rocky area, I came across another patch like it and didn’t want to press my luck. But recently I bought a nice pair of hiking boots and a trekking pole, and I’ve committed myself to hiking regularly, and I thought maybe I could try “A” Mountain again. It’s a little hard to see the “A” from this angle. Also, it’s a lot larger than it looks–60 feet tall! I took the light rail to downtown Tempe. There are two stops at the foot of the butte. I got off at the Veterans Way/College Ave stop. The first part of the trail is a gravel path which is sometimes a gentle slope, but mostly steep steps reinforced by wooden railroad ties. I stopped often along the way to take pictures. The light rail train approaching the Mill Ave/3rd St station. The lovely Tempe Mission Palms Hotel. Always construction in Tempe and on the Arizona State University campus. This is the desert, folks, as you can see from the landscape along the trail. After a while, the gravel path connects to an asphalt one, which is rather steep, but has a hand-rail. It ends at a level area with benches and a trash bin, a good spot to take a break and snap some photographs. Then we’re back to an unpaved trail. It seems to me that the trail has deteriorated a lot in three years. The soil has eroded to such a degree that some of the steps are almost three feet high, challenging for a little old lady like me with two artificial hips. Here’s a hazy view of Sky Harbor Airport (upper left; control tower center) and the Phoenix skyline. Eventually you get high enough to see what’s on the other side of the butte: State Farm Insurance’s new headquarters and the Tempe Town Lake, built out of the dry Salt River bed. Also, by this time we are on the stretch that caused me so much distress last time. The path is steep, uneven solid rock with lots of nooks and crannies. I think I wore ordinary sneakers last time; hiking boots are much better on this kind of terrain. I carefully watched where I put my feet so that I wouldn’t turn my ankle. Because my eyes were down, I didn’t notice that the handrail on my right, which I was hanging onto for dear life, abruptly ended. Unfortunately, another handrail, to my left, would not be within reach for two more steps. In my surprise, I awkwardly swayed on my steep footing until I could maneuver my trekking pole into service. Can you make out the gap between the handrails in the picture below? After that point, there was one (or maybe two) tall staircases fabricated out of concrete. Then there was another stretch of uneven solid rock. It was there that I turned around last time. 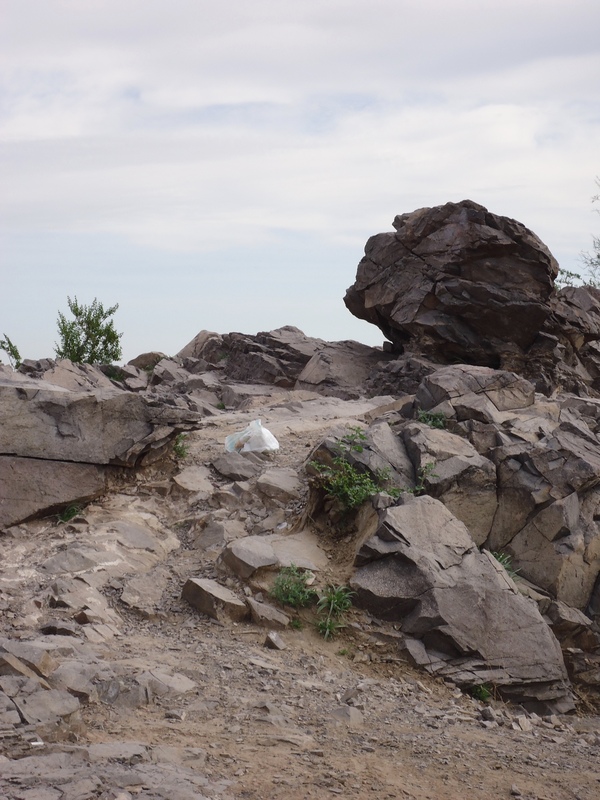 This time I continued onward and was rewarded by a lovely view of Camelback Mountain (near the left horizon; from a different angle, it is easier to make out the camel’s head, neck, and hump; in this picture you really don’t see them unless you know what to look for). It took me about 35 minutes to go up, taking photographs along the way, and about 25 minutes to come down. A lot of people, especially college students, passed me coming and going, so it is possible to do this hike in a significantly shorter time. You use different leg muscles coming down, and it’s steep, so I walked with care. I decided to take the asphalt path all the way down and bypass that first stretch of railroad tie steps. I ended up having to wander a long way around the base of the mountain to get back where I started. If you’re interested, a very well-written online review details hiking the butte with kids. Butte—an isolated hill with steep sides and a flat top (similar to but narrower than a mesa). When we were house hunting in Arizona in the summer of 1988, one of the sights we saw was a mountain with a big A on it, just a stone’s throw from Arizona State University. The A is supposed to be yellow (ASU’s colors are maroon and gold), but we’ve seen it every color of the rainbow (including plaid), even though unauthorized personnel are forbidden from painting it. Found on Yelp.com posted by Ron G.
We moved to “the Valley of the Sun” (the greater Phoenix metropolitan area) in August of that year, and one of the things I looked forward to doing was hiking A Mountain, also known by Tempe Butte or its official name, Hayden Butte. Of course, as soon as we moved into our new house, I became pregnant with our fifth child. And other aspects of life intruded. And I never got around to it. But I kept it in mind as something I wanted to do someday. When I started this blog last year, I thought it would be fun to post photographs taken from the top of A Mountain. I could cross one item off my bucket list and get a good workout in addition to gathering content for the blog. And yet, every time I planned to do it, I got derailed. It was too hot. Hubby needed my car. It was raining. My hip hurt. Add to that my husband’s suspicions that I wasn’t up to the job. I am a 63-year-old lady with osteoarthritis, after all. And I am not a hiker. But when Wednesday, December 30, 2015 dawned, there wasn’t a single good reason not to try it. Knowing my physical limitations, I gave myself permission not to force myself to climb to the very top. Yet I got pretty close. Several times I thought I was almost there, just to crest a rise and discover I had another hundred feet to go. Part of the path was made of steps created with railroad ties; another part was paved in asphalt; another part was concrete stairs; another part was rock, at jagged angles (the one spot where I almost fell). When I came to a second rock section close to the top, I pronounced myself high enough. Lovely stone pillars dot the path.